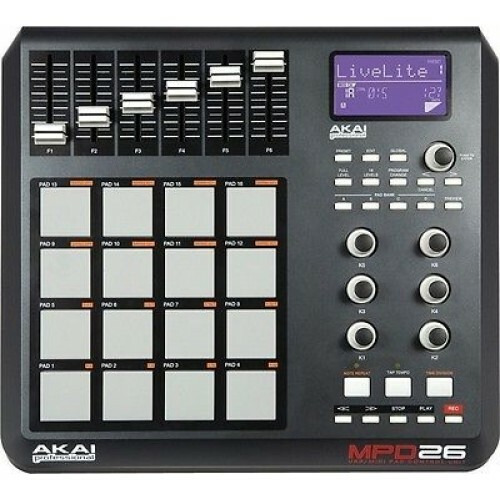 For generations of hip hop and electronic music artists, the Akai Professional MPC line has been one of the essential cornerstones of groove production. 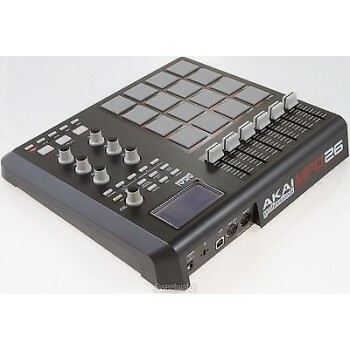 Now, Akai Professional brings the technologies that made the MPC a vital music production sampler to their hardware controllers. The MPD26 merges classic MPC functions including Note Repeat, Swing, 16 Level sensitivity, and Full Level sensitivity with modern Q-Link knobs and faders as well as an easy-to-read backlit screen. With the MPD26, you get 16 real MPC pads, plus dedicated transport controls that transmit MMC and MIDI to your DAW and sequencing software. And since it offers MIDI-over-USB and traditional 5-pin DIN MIDI, you can take control of both hardware and software with the MPD26. Access four different sounds from each of the MPD's genuine MPC pads, for a total of 64 options right at your fingertips. The MPD26 also features assignable Q-Link controllers, which enable you to control nearly any of your software's parameters in real time. Six assignable Q-Link faders and knobs, allowing you to spend less time with the mouse and more time making music. The MPD26 also gives you a dedicated set of transport controls for instant access to the most commonly used DAW or sequencing-software controls. 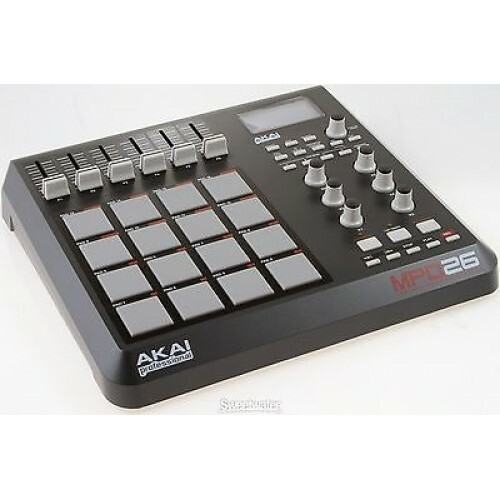 The MPD26 goes beyond the functions of a typical MIDI controller. While it sports 16 velocity-sensitive genuine MPC pads, it incorporates far more MPC series technology. Note Repeat is a one of the capabilities that has made the MPC indispensable for hip hop and electronic musicians. It enables the MPD26 to automatically play and hold a rhythm pattern, such as 16th notes on a hi-hat, with a single pad press, making beat programming fast and accurate. The MPD26 also features MPC Swing. MPC Swing is sometimes referred to as "the heart and soul of hip hop" because it turns perfectly aligned sequences into human-feeling time alignments. The MPD26 even allows you to specify exactly the degree and timing of swing you want to apply to its swing, for the perfect feel. The MPD26 sends MIDI information over its plug-and-play USB interface so you can use it with your Mac or PC without installing any drivers. The USB connection even powers the MPD26 so the included USB cable is all you need. The MPD26 also has traditional 5-pin DIN MIDI input and output jacks so you can use it with MIDI hardware, including synths and sound modules. The MPD26 comes with Ableton Live Lite and an editor/librarian program so you can start creating right out of the box.